The Rowley Hills, showing grassland in the foreground and scrub on the slope. Much of the Portway Hill site in the Rowley Hills has been split into small plots of land, some of which have been bought by various different parties. 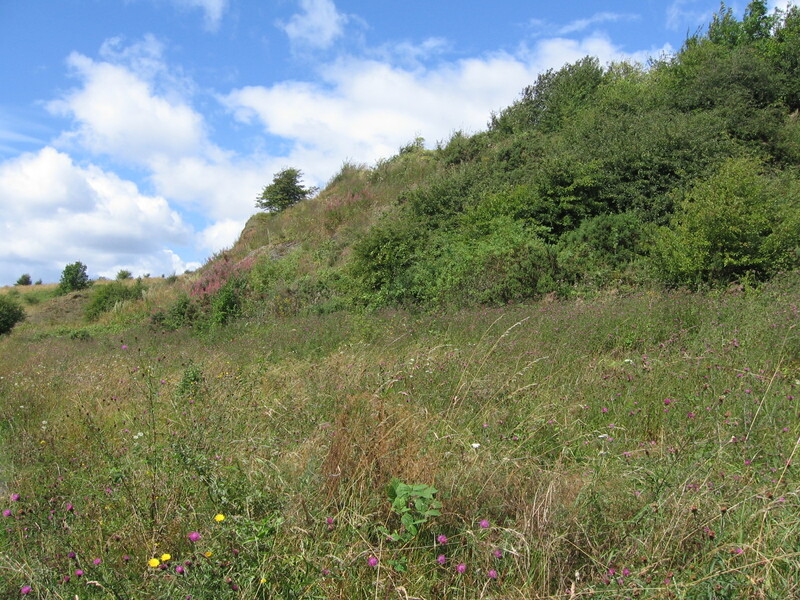 The Wildlife Trust for Birmingham & the Black Country, who we work very closely with, have bought one plot of land – their Portway Hill reserve. They manage this land to keep it in an optimum state for wildlife, primarily by removing scrub that can otherwise take over the valuable species-rich grassland. Although both types of habitat have value for different sets of species, if left unchecked the scrub could completely replace the grassland, so to support an overall greater range of plant, insect and bird species it is best to maintain a ‘mosaic’ of both types of habitat. As the Wildlife Trust cannot undertake habitat management on the other land plots that they do not own, their current approach is to concentrate on maintaining the grassland on their site, as there is plenty of scrub developing elsewhere on the hills. This will enable us to conserve the all-important mosaic of habitats, and to enhance the site for people through improved signage, information and footpaths.